Do you want to close your Kotak Bank Fixed Deposit? Then you don’t need to visit Bank, you can close Kotak FD account online using net banking. Kotak FD account can be opened online using net banking and mobile banking. You can earn more interest in Kotak Bank fixed deposit compare than other banks. Now click on Banking tab. Here you can see Premature withdrawal of Deposit, click on it. Next screen select your FD account and enter full FD amount which will be transferred to your saving account, select your saving account and click on submit. Done! your FD account is closed and the amount has been transferred to your saving account. If you want to withdraw some amount from your FD account then no need to close your FD account, you can partially break your FD account. 1. 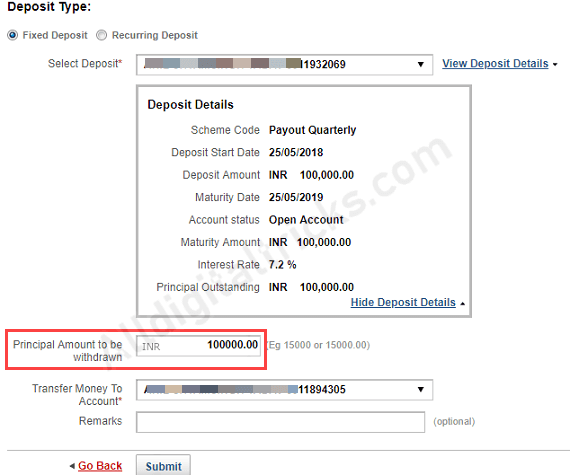 What will happen if I withdraw fill amount from FD? If you withdraw full amount from FD then you FD account will be closed. 2. Do I need to visit Bank to close my Kotak FD? No, you can close your Kotak Fixed Deposit by withdrawing full amount. 3. I have closed my FD account mistakenly? Don’t worry, the FD amount already credited to your saving account, so you can open FD account again using mobile banking and net banking. 4. 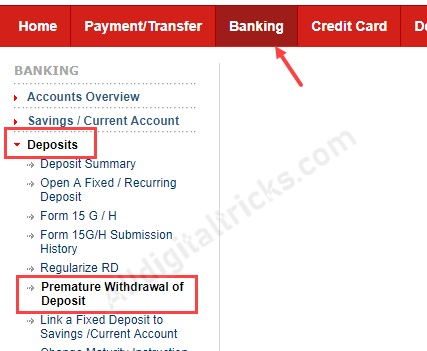 Can I withdraw money without closing my FD? Yes, Kotak Bank allows you partial withdrawal facility, so you can withdraw some amount from your fixed deposit using net banking. Hope you now understand how to close Kotak Bank Fixed Deposit (FD) online.